I find myself playing more and more darts at the bars. One bar in particular everyone seems to bring their own darts. I have been using their darts some and the difference between crappy darts and good darts is crazy. I love playing, but I know nothing about darts. I have a cork board at my house that has really never been used (plan on changing that), and I play cork at my friends house. Now at the bars, it is soft tip. What I am told everyone does is get soft tip darts, and then buy metal tips to use on the cork. So you are playing with the same darts on both. 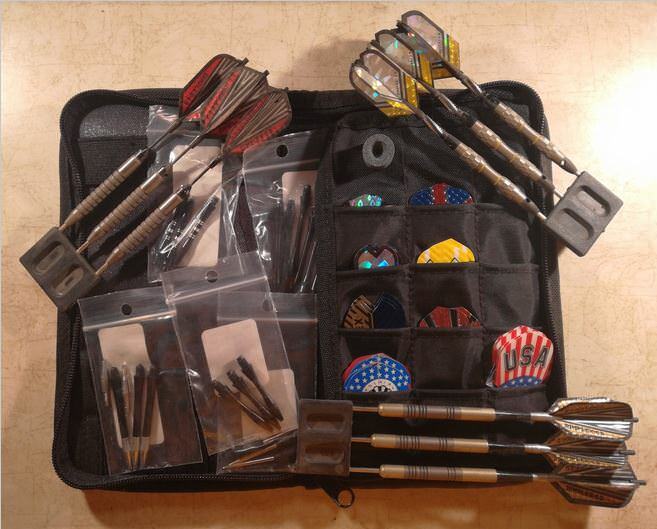 I wouldn’t mind paying $70-$80 for the darts. Plus I need help on getting the right steel tips to go with them. What brands should I look at? Where to buy? I do like a little grit on the grips. Not a fan of the smooth as much. Often, the bars that are big into darts will have a small selection of darts for sale. Back when I threw darts regularly, it seemed to be a very personal decision as to what "felt right" to each player. If you get competitive, I don't know that I would do a lot of changing of what is used as to a degree it is about muscle memory. As I recall, soft tips work on felt cork boards. It might require a bit more umph until the board is more used. Tips and flights are consumables. edited to correct board type. Played before 'soft tip' became a thing, so take with a grain of salt. I would suggest you go somewhere where you could try some wildly different designs (weights, sizes, etc.) to get a sense of what's out there and see if anything outside your current experience tickles your fancy. My dart shop was Arlington Dart Shop near Boston, but that was years and years ago - not sure if it's still in business and, regardless, Arlington MA would not be convenient from Germantown, TN. Hopefully there is somewhere near you that has a variety to try. For me, I liked small, precise, dense darts and wound up with a set of tungsten darts. My friends liked large heavier thicker-bodied darts. There's no right or wrong, just get a bit of variety before locking in. My experience being from the elder days, I don't have a sense of whether these days it would be better to have two sets - one for soft tip targets and one for regular - or whether switching the tips back and forth can be done without introducing balance/weight differences that might mess up your muscle memory. Is the reason for this because soft tip games require lighter darts? Having thrown back in the 90's, I'd be tempted to get a more basic dual set now, and then get some heavier dedicated steel tips later on. Having only ever thrown steel tip, maybe I'm biased. A quick search shows https://www.dartworld.com/more...sion-18gr-18950.html but I don't know if those are any good. They still have a huge selection. Here's my "kit" (with case, spare shafts, flights, tip sharpener, etc.) that is used with a bristle board. Very subjective, everyone likes a different weight, length, knurling, shape, material and even brand. I will say that you most likely won't be disappointed with hammerheads. Years come and go and every time I take mine out to a bar people always bring up a conversation. Either they love them, they have their own set or they are saving up to buy some. There are many different styles in the hammerhead line now, so you have to research them and see what you like. Not the cheapest darts that is for sure, especially when you see pros winning world competition with 25 dollar darts. But there is something very satisfying when you hear them sinking into the cork. I have two sets, the hammerhead originals and set of hammerhead heavyweights. I prefer the wide barrel but I have huge thick hands/fingers. I also prefer the straight barrel designs. If I were you I would buy a tiny pocket scale, and spend money buying cheap darts of all sizes and weight. Pure china crap. Then when you have a better idea of the size/weight/materials/style then you'll be in a better place to spend 100 bucks and get what you really like instead of what other people like. Thanks for the tip guys! I probably play 50% at the bars electronic boards, and 50% at my friends bristle board. Honestly we start at the friends house, pre game it a few hours, then head to the bar. I was told to get soft tips because you can quickly and easily convert them to steel tip and I end up using the same dart all night. Are any brands better than others? I probably do need to find a local place to touch and feel before buying. I was considering these as my first set. Based on your last post, I don't think you need steel tipped darts. On a new bristle board soft tips aren't easy, but once broken in a bit, they shouldn't be an issue. Forgive me though, it has been close to 20 years since I have played. My memory might be twisted up.